I know pre-season is already underway (check out The Jack Cast podcast for more on that), but for a bit longer I'm planning on looking back at stats from the World Cup. FIFA's website has a load of detail on individual matches and overall stats although for a lot of the more detailed information is held in a multitude of PDF files (how I've put the data together is too dull for even a stats blog, but will probably cover it on my business blog at some stage). I've done plenty over the last couple of years with Opta data but it was interesting to see FIFA provide information on distance covered and sprints for each player for every game which adds an extra layer of data. 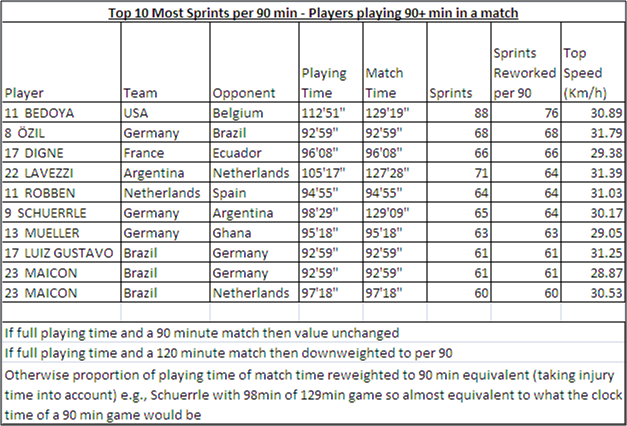 What I've created is a dataset with factors such as time played, distance run and number of sprints, I've reworked the figures to re-calibrate to a 90 minute equivalent where someone has taken part in extra time (if someone has played a full match which with injury time is usually around 95 minutes then this is classed as 90 minutes). As with any stat, context is key. Prilo's stats against England show someone who only sprinted 5 times in the game. That doesn't make Pirlo lazy but someone who was able to control the game which was particularly useful given the conditions in Manaus. 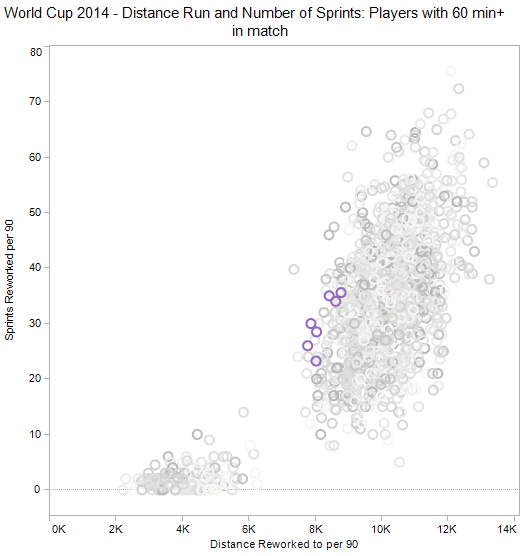 At 538 recently they had a piece looking at something similar in terms of distance covered by Messi over the tournament and it's certainly true that he's at the lower end of the scale in terms of activity but like Pirlo that doesn't necessarily make him tired or lazy and would need to be compared to his normal output for Barcelona. Messi's Distance/Sprint stats (dark purple) compared to all other players. He's certainly at the lower end of the distance scale but no set pattern in terms of games. Lowest distance covered was against Iran which will be not because he wasn't trying but because Argentina had most of the ball so fewer transitions between attack and defence. In terms of the top sprinters, the top 10 shows it's not always a good attribute as 2 of the top 10 performances came from Brazilians against Germany (all well and good sprinting, but if that's sprinting back to try and recover a 3 on 2 due to you sprinting up and out of position in the first place then that's not so great). 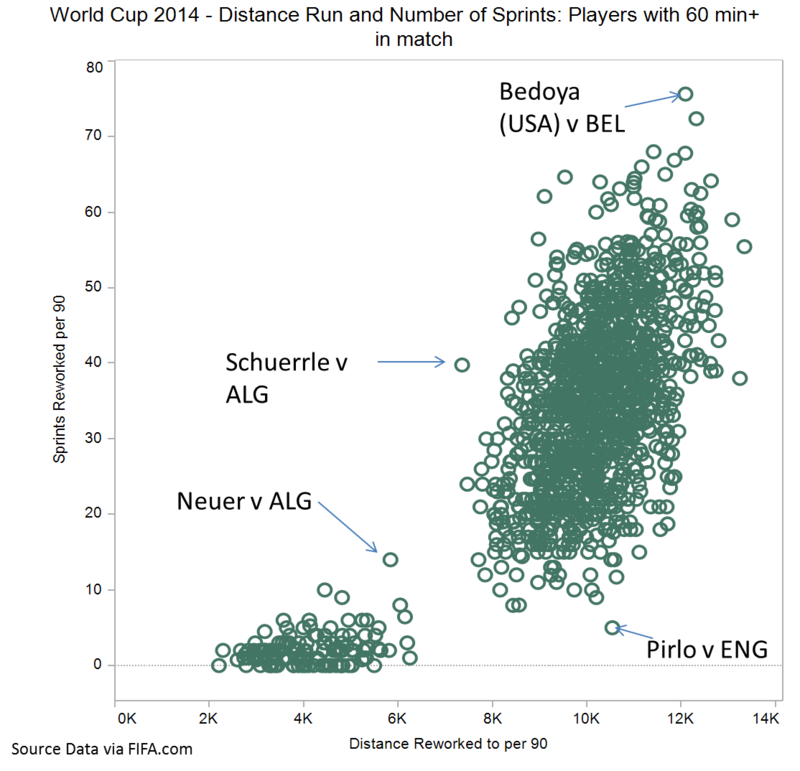 Top sprinters - playing 90+ minutes of a match to avoid cases of high impact subs who might per minute produce higher rates. Could also look at different levels for the cut-off. For distance, again the USA come out on top, this time with Bradley having 3 of the top 10. With anything like this there's always all sorts of caveats such as the type of match (e.g., is one side dominating possession or is it end-to-end, the amount of time the ball is in play - I'd expect a stop-start game like Brazil-Colombia might be low on overall distance run), but provides some areas of interest. One of the biggest criticisms of British football is the love of someone who can 'Just fahking run around a bit' over technique and if 'having a good engine' was everything, then it'd be Mo Farah rather than James Rodriguez being unveiled at Real Madrid. As always it's a balance between skill and athleticism but I'd imagine it'd be far easier to improve someone's physical condition that their skill level, especially beyond their mid-20s.